Dreamforce, Salesforce’s annual user conference, brings in over 150,000 people from all over the world to showcase Salesforce products and create customer success through sessions and keynotes. This year, there were even private performances by the Foo Fighters and The Killers. Each Salesforce product has a dedicated demo space at the conference, and this year SalesforceIQ was a main feature. 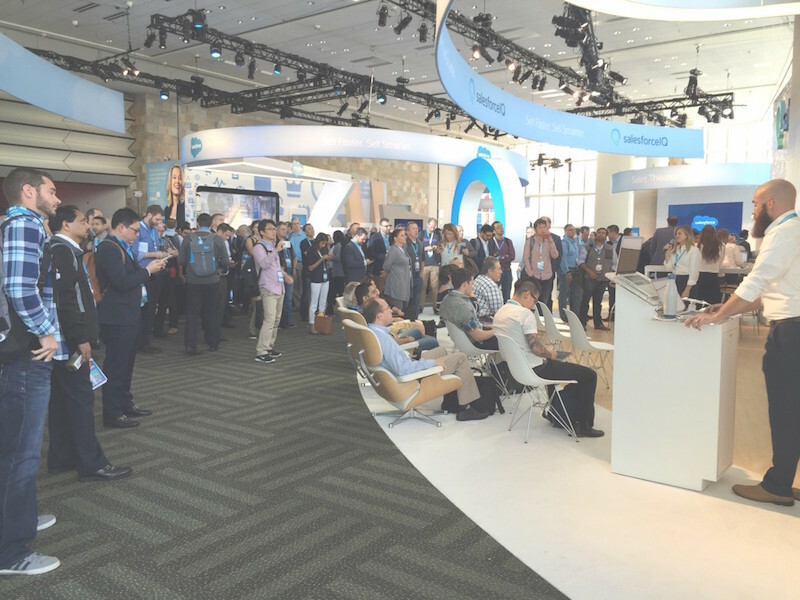 This challenged us to go beyond our day-to-day marketing responsibilities and move into a massive effort to design the product showcase space at Dreamforce. Although both small and large businesses use SalesforceIQ, the lessons we learned about event design can apply to any type of business, regardless of size, in the following 6 simple steps. Chances are you already know the goal of the event, and it’s probably raising some sort of key metric. For the SalesforceIQ marketing team, which includes our communications design team, our goal was to significantly raise our products’ trial numbers. 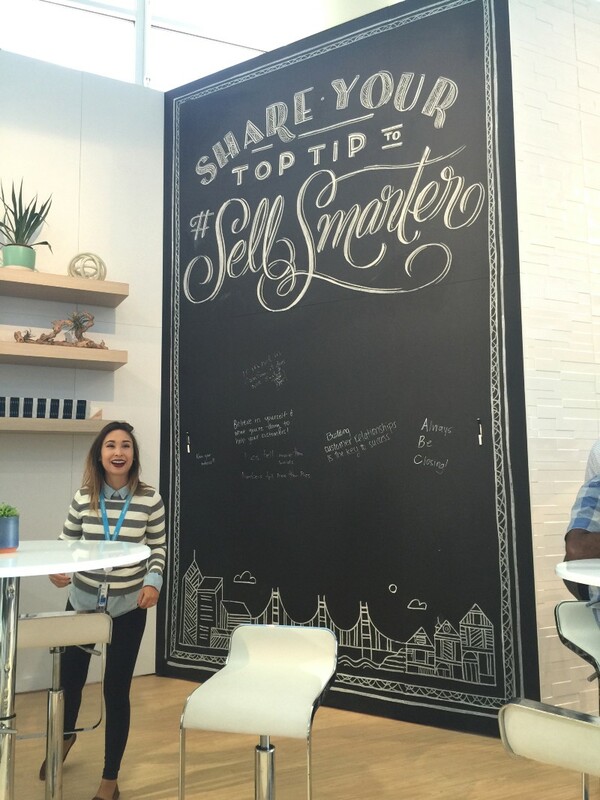 Our Dreamforce zone needed to highlight SalesforceIQ products in a way that drove attendees to sign up for a trial. The overall budget for the event was previously determined, but we helped guide how parts of the budget should be utilized in order to achieve the marketing team’s goal. How do we want attendees to feel when they walk into our zone? How do we want to stand out among the hundreds of other areas? How do we want attendees to engage with our products in the space? Once we had a decent list of traits, we defined the words and included examples (places and people) for each word. 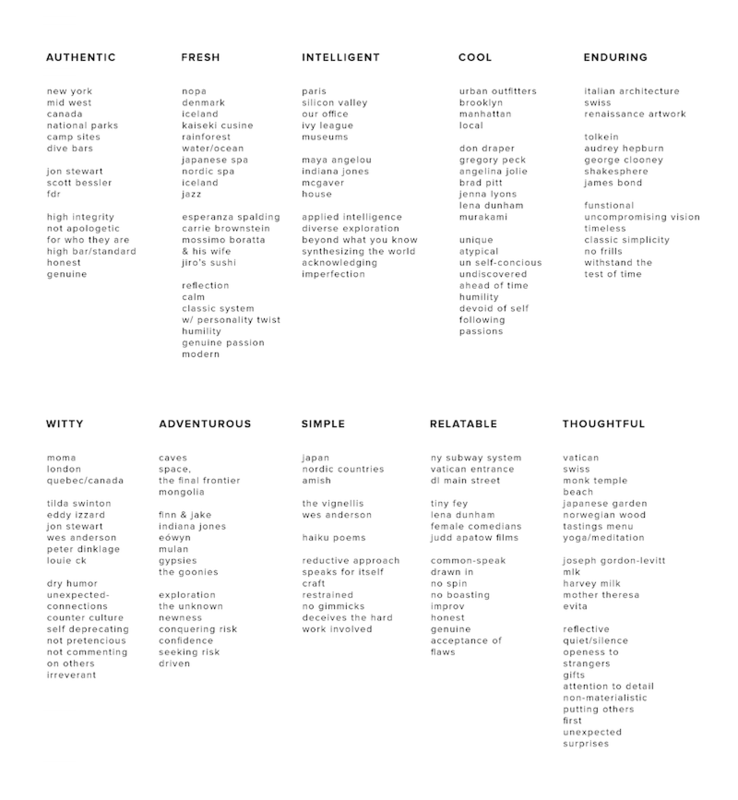 From our lengthy list, we extracted our most important characteristics: authentic, enduring, simple, and fresh. This exercise got us to think about places that utilize simple, fresh design that people can also relate to—spaces that feel inclusive and long-living. 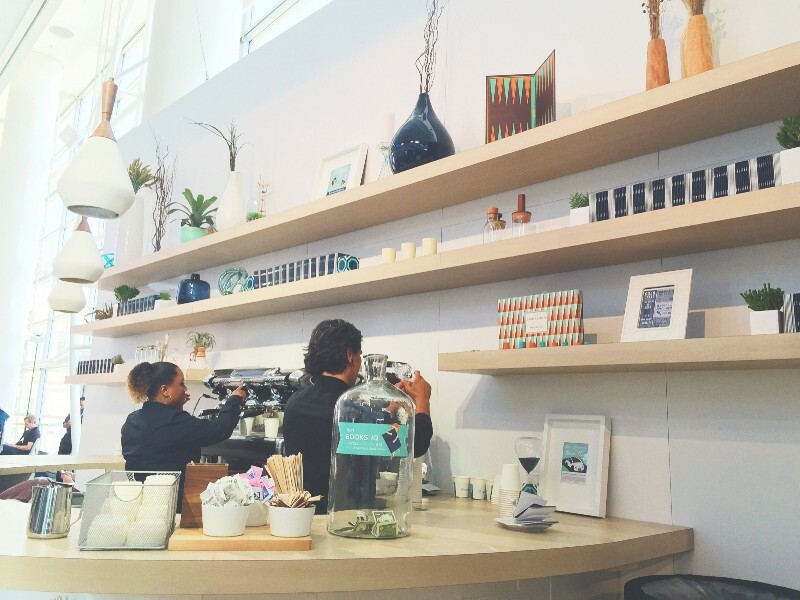 Through this process we came up with our winning piece of inspiration: coffee shops that utilize clean, Scandinavian design. Thankfully, the San Francisco Bay Area (where SalesforceIQ and Salesforce are located) is full of those types of coffee shops. We probably destroyed our kidneys after making multiple trips to Reveille, St. Frank, The Mill, and Mazarine Coffee. 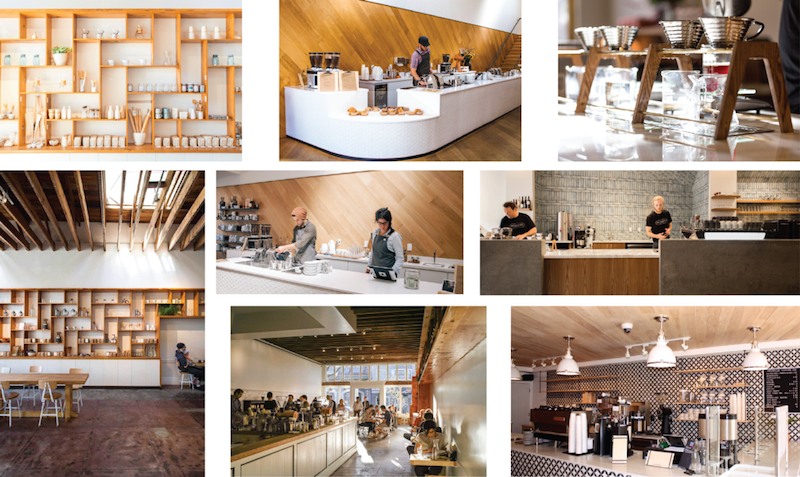 Images courtesy of The Mill, St. Frank Coffee, Reveille Coffee, and Mazarine Coffee. It was easy to use the inspiration from all of the coffee shops we visited to come up with an area that invited people in by the natural look of our space (shelving, communal tables, real plants, the smell of espresso), as well as by showcasing an impressive product, because it was all very exciting and felt personal. Once you have a decent idea of the intangible aspects of your area (its identity) and the tangible (space and budget restrictions), you’re ready to sketch. Before beginning to sketch out ideas for your space, keep in mind the amount of square footage you’re given and the amount of items you can fit into the zone without overwhelming it. For us, we knew that we had to think about items like laptops, mobile devices, large screens, intimate table settings, swag distribution, and miscellaneous decorations. Once you determine those needs, sketch options to help decide how customers enter and flow through the space. 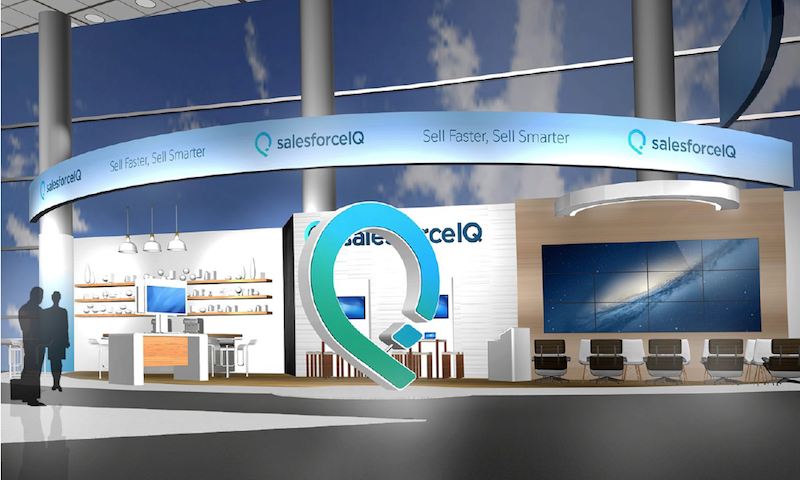 For SalesforceIQ, this meant exploring how customers would flow into the demo stations showcasing our products. We were lucky to partner with an event marketing agency to review renderings of the sketches that were created. Image courtesy of GPJ Design. In the sketch pictured above, customers enter our area from the right. It made sense to immediately showcase our products where customers entered. 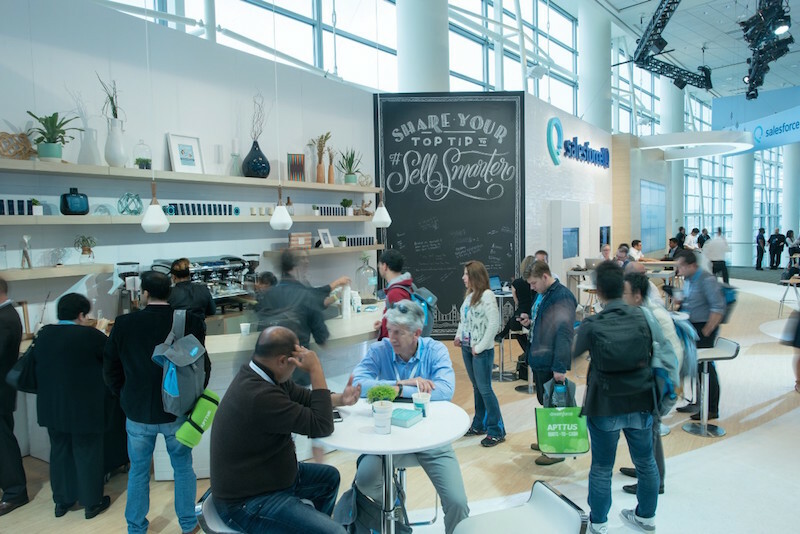 We designed the flow so that our coffee bar experience was located at the opposite end of the entry point, which pushed customers to pass our demo stations in order to get their caffeine fix. The distance that customers had to cross gave us opportunity to invite them into our demos or give them swag so that they could check us out later. Our large logo icon, or our “Big Shiny Object,” was strategically placed so that it could grab the attention of attendees riding the escalators up. Because we’re part of Salesforce, we were provided with multiple resources that helped us build out the zone and manage our budget so that we could get everything done. Even so, it was important to carefully organize scheduling for the day that the space was built—and also for taking down the space. It’s helpful to make a timeline/schedule for managing your area, especially if you have multiple vendors to manage or jobs that that may take extra time. Try to think of any potential issues that might come up during the creation and execution so that you can get ahead of them and have contingency plans in place. We shopped and curated every piece that was placed on our coffee shelves and personally chose the furniture that fit well within our space. We purchased plants well in advance and watered them for weeks before the event so that they looked fresh throughout Dreamforce, and we made sure to choose a specific illustrator to have the best chalkboard wall possible. Chalkboard by Alice Lee. She’s not pictured here—that’s me. Our swag was distinct and original. We’re known for giving out colorful and playful socks (this year we coined them as #smartsocks), and we created a field guide that included games, activities, and sales jokes—all originally illustrated and designed by our team. These added a personalized touch to the event and gave us a sense of ownership and immense pride for the experience we created. Plus, Dreamforce attendees really enjoy thoughtful swag, which leads to social shout outs—another win. We made sure the space looked pristine throughout the entire event, which caused our extended team to also feel proud about the zone and do their part in its upkeep and promotion. My favorite Dreamforce memory was on the second-to-last day of the conference, which summed up how the space worked throughout the conference. The line at our coffee bar was 50 people long and it was standing room only in front of our largest demo station. At that exact moment, Marc Benioff, Salesforce’s Co-founder and CEO, came by and said our zone truly felt like SalesforceIQ and that it looked like our team and our brand. And that’s exactly what we were going for. Great event design means doing your brand justice. Camellia is an illustration-focused designer in the San Francisco bay area and she takes her cappuccinos with soy. SalesforceIQ is always hiring talented designers.